Preschoolers will love to put all of their Spiderman and Friends Superheroes and vehicles to task with this Super Hero Playset. 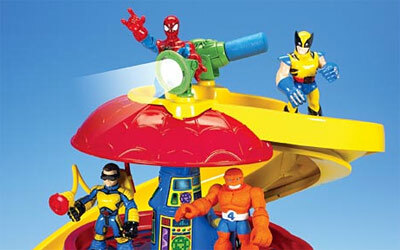 This Pump-Up Powered playset is where Spiderman and Friends begin their adventures. Children pump air into the chamber and twist the easy-to-use Spider Dial to select the feature they want to use: the Pump and Lift Elevator or the Pump and Slide Web Line. The Race and Fun Slide, the search light, and the electronic console with LED lights help encourage pretend play scenarios. Comes complete with an exclusive Spiderman figure. Spiderman and Friends are superheroes that use their powers in positive and constructive ways to aid those in need. They're designed to hold the interest of and to be held by pre-schoolers. Bigger bodies and feet allow them to stand up to anything a pre-schooler can dish out. And larger accessories, like interchangeable backpacks, let your child take part in adventures that stretch the imagination.